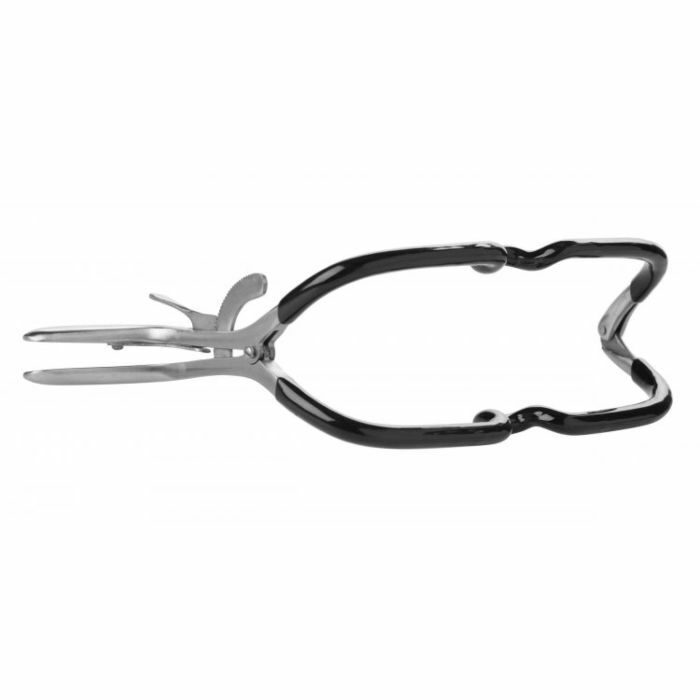 Add a little comfort to your torture with the Master Series Rubber Coated Stainless Steel Jennings Gag. This easy to use medical gag may look terrifying yet it is a pleasure to work with. Once it’s locked into place your sub will have no escape – their mouth will stay wide open for whatever reason you desire. This top quality medical gag is often used by dentists and doctors to keep the mouths of their patients wide open during procedures. The hinges at either side have an easy to use ratcheting feature that securely holds the gag open once you set it into place. To use, place the loops on the inside of the gag inside the mouth resting on your sub’s teeth. Now slowly pinch the two levers on the side to gently open the gag. The ratcheting mechanism will keep the gag from shutting no matter how hard your sub squirms. When you’re done simply press down on the small lever on the top to release the lock. A welcome twist on the classic Jennings Gag, this updated version features a black rubber coating for comfort as well as to keep the gag from slipping out of the mouth.